This is going to be the last post from the blog series dedicated to my Mom "From My Mom'z Diary". Earlier I posted about my Mom's first Hair dyeing experience with Garnier Color Naturals Hair color, so when one dyes hair one need to have a good colour protection shampoo, we chose L'Oreal Paris Elvive Colour Protect. How it turned out... To Know More Read More!!! CONCENTRATED NOURISHMENT + UVA/UVB FILTERS. THE SCIENCE OF COLOURED HAIR. Colourants can alter the natural protective layer of the hair, making the fibre more sensitive to external aggressions such as sun and pollution. To help protect your hair, a specific protective care is needed. 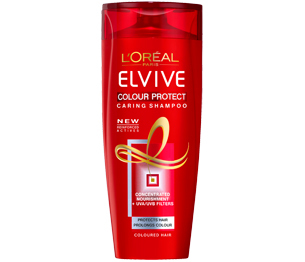 L'Oréal Paris has created Elvive Colour Protect, the UK's No. 1 for coloured hair*. New formula with reinforced actives. The formula, now even more concentrated in NOURISHING ACTIVES, bathes the hair and transforms its surface. Hair feels voluptuous to the touch. Enriched with UVA + UVB FILTERS, the formula helps protect hair from external aggressions and leaves colour shimmering. JUST COLOURED INTENSITY FOR UP TO 7 WEEKS***. *Nielsen shampoo and conditioner unit sales Jan 2010 - Dec 2010. **Instrumental test after application of shampoo + masque vs. classic shampoo. ***Instrumental test after application of shampoo + conditioner. As My Mom got her first hair dye we chose this shampoo for her. It is good and makes her hair feel soft and smooth and she doesn't feel that any chemical thing happened to her hair. I also used it during my stay, I do not have colour treated hair, but I found it good as it tamed my hair and it was as if I am washing my hair with milk. Overall we both found it to be a good shampoo and I am thinking of buying its conditioner for my Mom to make her colour treated Hair care more effective. 4/5. I found it to be good but have no experience of any other colour protection shampoo yet. I bought it for Pkr 465/- from Al-Fatah Lahore. Can be found nation wide from stores having L'Oreal Paris skin/hair care products. Hope you all liked this post and also the blog series "From My Mom'z Diary". Do comment share, tweet, like, G+ and pin it. Note: This is not a PR product. The experience shared is not mine but my Mom'z. I will buy this for my mum.she is right now using pentene pro v for colored hair. my mom is using Pentene pro V for colored hair which is working great for her.but will buy this one now. Hey great post. I'm definitely trying this shampoo for my hair. Your post gives a lot more information than their website - http://www.lorealparis.co.in/haircare/women/colour-protect.aspx.